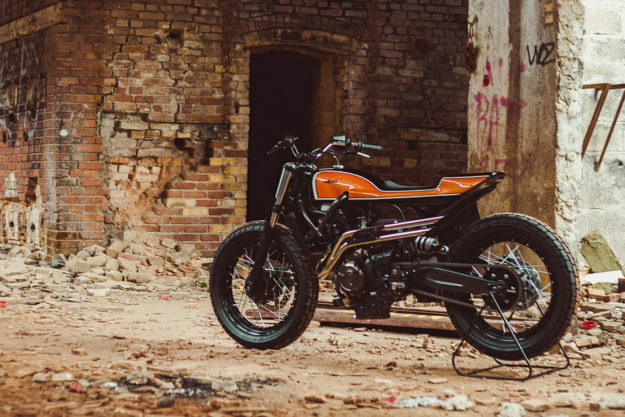 The Yamaha XSR700 is a smash hit with both owners and journalists in Europe, and two years after its introduction, it’s becoming a hit with customizers too. 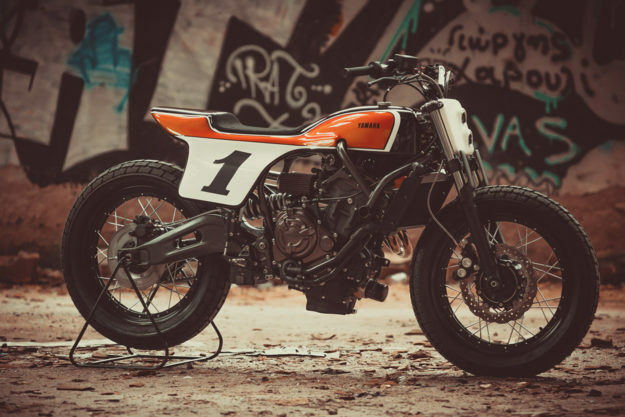 The latest fan club inductees are Jigsaw Customs of Greece, and their new XSR is one of the sharpest flat track-inspired customs we’ve ever seen. Jigsaw are based in the small town of Nea Makri, on the coast looking out to the Aegean sea, some 25 km northeast of Athens. It’s not a company we’ve heard of before, but they’re definitely on our radar now. 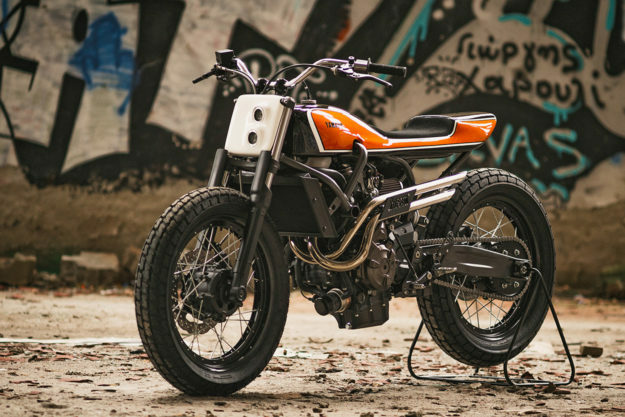 ‘The Slider’ debuted at the Wheels & Waves festival in France a few days ago, and it’s Jigsaw’s second Yard Built commission from Yamaha Greece. 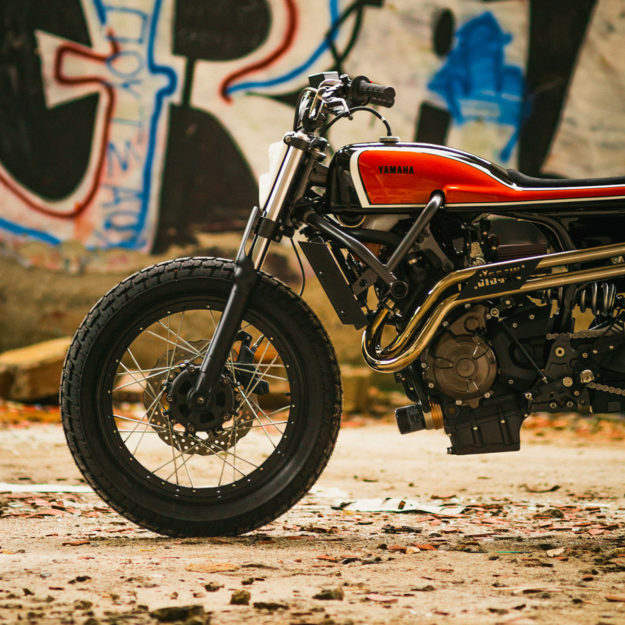 Petros and his crew decided to build “A fun and lovable bike, like the minimal, lightweight TZ750 and XS650 old school flat trackers.” They started by taking off almost everything except the engine, frame, swingarm and forks. That meant goodbye to the stock bodywork, lights, fenders, wheels, gauges and exhaust. The XSR700’s controversial ‘fuel tank’ was discarded, and even the ABS system and its wiring loom. 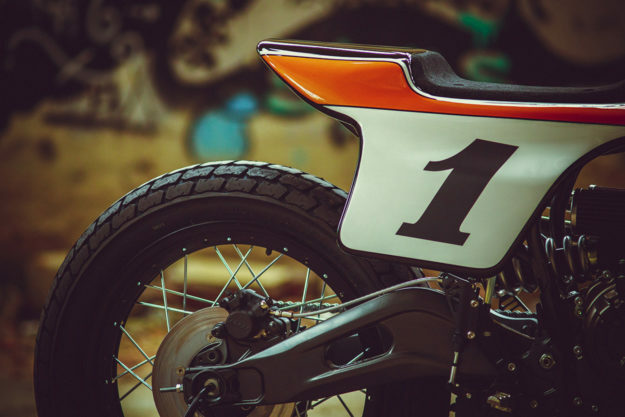 Wheels are essential to the flat track look, with 19-inch rims and Dunlop tires being the industry standard. Jigsaw chose to fit an XTZ1200 front wheel for its unusual spoke lacing style. The rear wheel also started life as an XTZ1200 fitment, but it’s been converted to a 19-inch rim with new spokes. To fit the XSR700 chain setup, Jigsaw machined up a one-off custom sprocket hub—with a slightly shorter ratio, for more rapid acceleration. There’s also a custom rear brake disc that works with the stock rear caliper. The slim, blade-like upper body looks just perfect—and avoids the characteristic ‘hump’ of Yamaha’s FZ/MT series of bikes. A deceptively simple number plate headlight surround sets it off up front. Some builders would just install a flat square of aluminum with a hole for a light, but Jigsaw have created a beautifully molded piece worthy of a factory designer, with raised surrounds for the two small LEDs behind flushed-in grills and bezels. 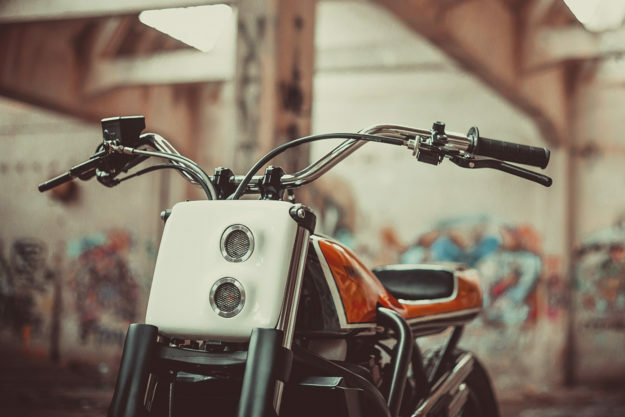 The minimal bodywork reveals the pipes feeding into the coolant bottle, which is now between radiator and cylinder head, and on the right-hand side of the bike, there’s a flat track-style number plate. The finish and detailing is top-notch and millimeter-perfect, thanks to 3D computer design. A CNC mold was cut and then copied in Plexiglas. After a test-fit and cleanup, the bodywork was ready to be painted and a small-capacity fuel cell was built to fit underneath the monocoque. 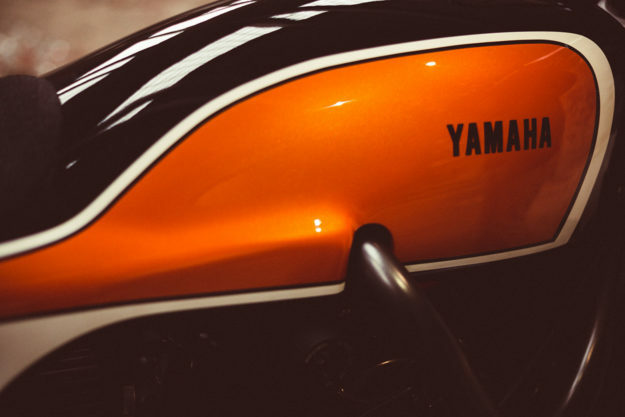 The paint is a delicious candy orange, an XS2 color used by Yamaha in 1972. Petros is so taken with the shade—officially called Mandarin Orange, we believe—he’s going to use it for his personal XS2 restoration project too. With such minimal bodywork, the wiring loom had to be cut down and carefully concealed. The stock size battery is still there, but now fitted under the swingarm in a custom mount. 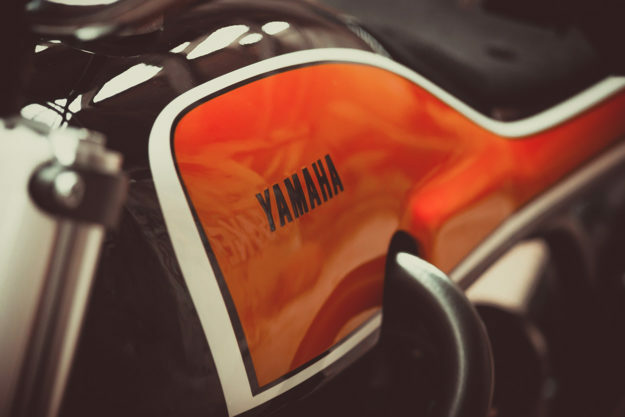 Being an official Yamaha dealer, Jigsaw have also sprinkled over some Yamaha genuine accessories—such as the foot pegs and levers. 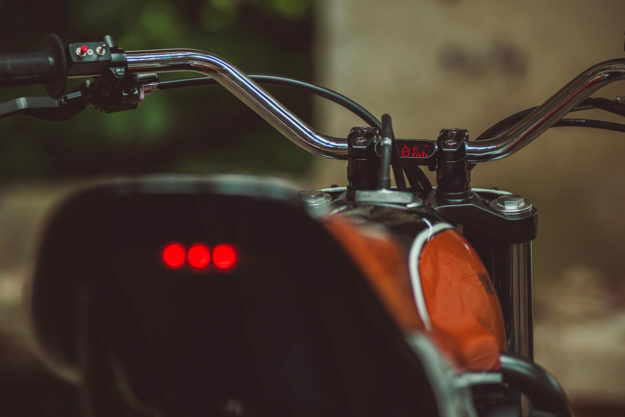 LSL flat track bars add a touch of authenticity to the stance, and Jigsaw have added their own custom switches for the horn, lights, and electric starter. The fork protectors are a neat fitment, and the rear lighting is hidden under the tail section. The ECU and relays are under the seat, and Jigsaw have turned the injector bodies around 45 degrees to give extra clearance to the fuel tank and fuel pump. It’s also allowed them to install custom 1970s-style pod filters from the Greek manufacturer DNA. 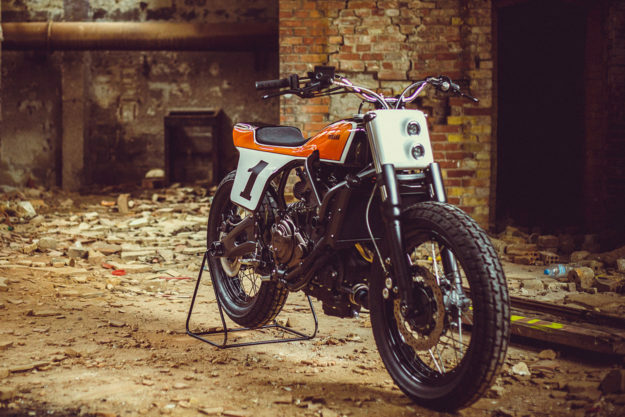 At Wheels & Waves, the XSR700 drew the crowds. It also caught the eye of legendary racer Randy Mamola, who took it for a spin in front of the cameras for an Alpinestars clip. Keep a look out for that when it hits the interwebs—and for the name Jigsaw. We have a feeling we’ll be hearing from these guys again.